Nigerian Instagram big boy, Hushpuppi has taken to his usual social media platform to shade those claiming he's living a fake life. His beef with another Nigerian Foreign based big boy, Mompha, has been one of the trending topics on social media lately. 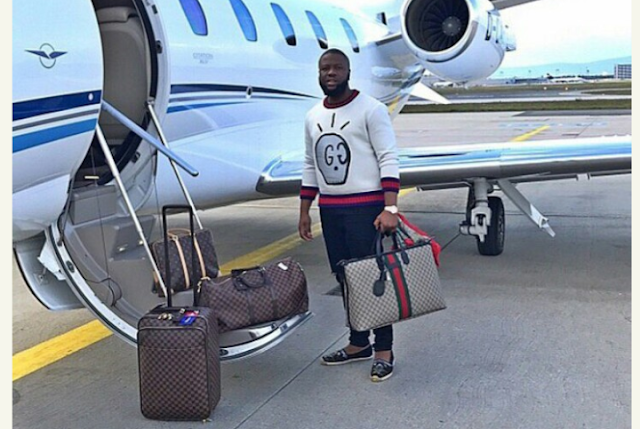 In series of posts, Mompha claims Hushpuppi, real name Ramoni Abass, was a guy he housed cos he was broke. He even shared pictures of the taxi he claims his father drives while he is always on Instagram showing off a fake life. Since the revelations from Mompha, social media has been awashed with a lot of shades and clap backs from both men. The latest coming from Ramoni Abass who begged God to to continue giving him a fake life if that's all it will take to make him continue enjoying the way he is. His quote below. For somebody who is broke, I spend quite a lot of money. For someone who's living a fake life, I think I have an amazing life. God if this life is fake, please continue to grant it for me, I don't want real life. He accompanied the above quote with a picture showing him about to board a jet while dressed in his beloved Gucci. One thing noticed about the post is that it was liked by Nollywood Actress, Tonto Dikeh and also Ex-BBNaija housemate, TBoss. This debunks a rumor that Tonto Dikeh unfollowed him after discovering that he lives a fake life. Snooping through his followers list, we find the Actress still intact as one of his followers while he doesn't follow her.